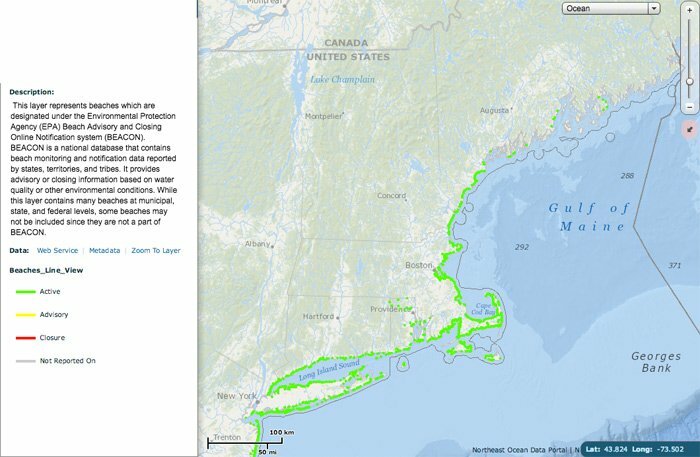 Now available in the Data Explorer is a map layer of beaches designated under the Environmental Protection Agency (EPA) Beach Advisory and Closing Online Notification system (BEACON). BEACON is a national database that contains beach monitoring and notification data reported by states, territories, and tribes. It provides advisory or closing information based on water quality or other environmental conditions. While this layer contains many beaches at municipal, state, and federal levels, some beaches may not be included since they are not a part of BEACON.